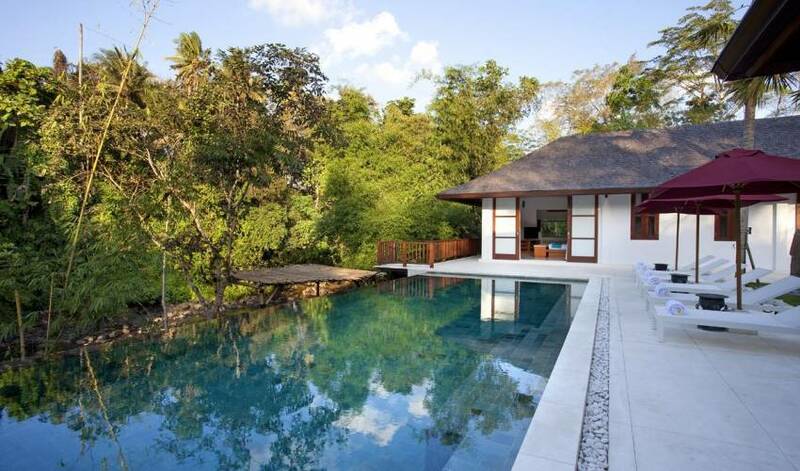 One of the two Nyanyi Riverside Villas sitting alongside a jungle-fringed river near the spectacular sea temple of Tanah Lot, the five-bedroom, five-star Villa Atacaya offers a peaceful, back-to-nature retreat to holidaymakers looking for an escape from life’s day-to-day madness. 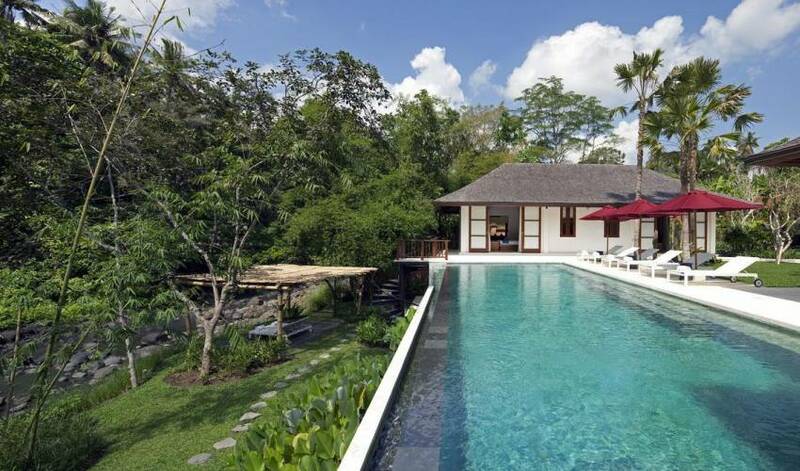 Spread over three levels, with a pretty garden courtyard and 15-metre riverside swimming pool, the villa is fully staffed and includes the services of a car and driver (at a special rate). Each of the five ensuite bedrooms presents differing views of nature at its best, while the communal spaces provide a superb choice of indoor and outdoor, formal and relaxed, dining and living options. Great for families or groups of friends. 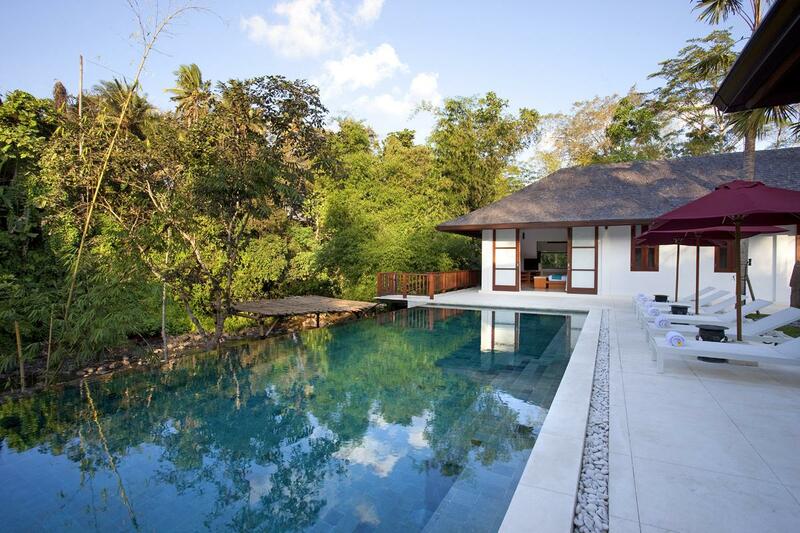 Welcome to Villa Atacaya, our secluded, riverside retreat in south-west Bali, where you will find contemporary architecture, five spacious bedrooms, and an abundance of natural beauty, just 13 kilometres from the bright lights, shops, restaurants and nightlife of Seminyak, and only a few minutes’ drive from one of the best golf courses in Asia. We built our home into the contours of the valley, and it is blessed with a spellbinding view of the jungle-fringed river. This is a nature lovers’ paradise; a place where you will see kingfishers, enjoy birdsong during the day and be lulled to sleep at night by the sounds of running water. We think you’ll appreciate the choice of indoor and outdoor living and dining areas, the glamorous bathrooms, the alfresco bar and the splendid 15-metre swimming pool, which appears to overflow into the river valley. The architectural design integrates natural water features including a pond fed by a holy spring and a creek that flows into the river. Sleek structures, ironwood-shingle roofs and eye-catching stone fittings and finishes – such as the bright white acid-marble terrace, the metallic slate bathrooms, and the river-rock bathtubs – reflect the ambiance of the location and the purity of the gorgeous surroundings. The villa is complemented by sophisticated facilities and superb service from a full team of caring staff including a manager, butlers and a chef, so that that you will have no real need to go out for meals or entertainment, although we do provide the complimentary services of a car and driver for up to eight hours a day should you wish to explore beyond the villa. 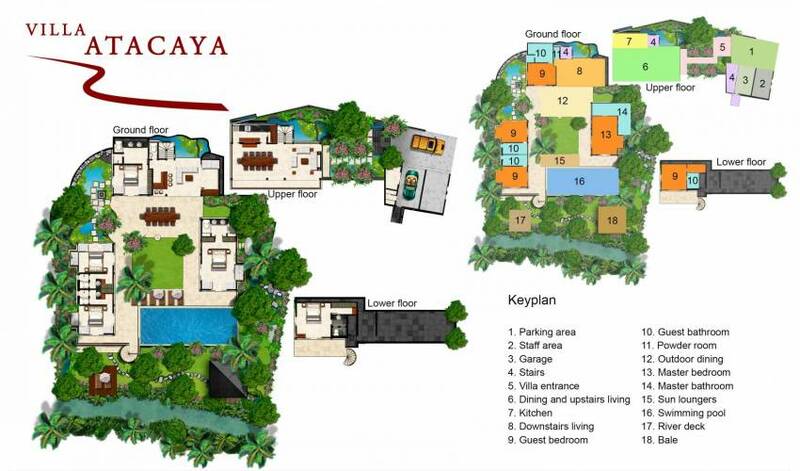 The villa shares a dedicated 400-square-metre wedding space, a driveway, parking area and staff service facilities with its neighbour Villa Iskandar. When the two villas are rented together they offer a 9-bedroom option for large groups of friends, extended families and wedding parties. The three-tiered villa is entered on its top level via an open-sided living and dining room that lies adjacent to a self-contained kitchen. On the middle tier is a pretty garden courtyard with an outdoor dining area and covered lounge flanked by a bar and a small, air-conditioned TV room. The courtyard is bordered by a 15-metre pool overlooking the river, and four of the five bedrooms are also housed on this level. From here, a spiral staircase winds down to a riverside yoga deck, a bale, and the studio bedroom. 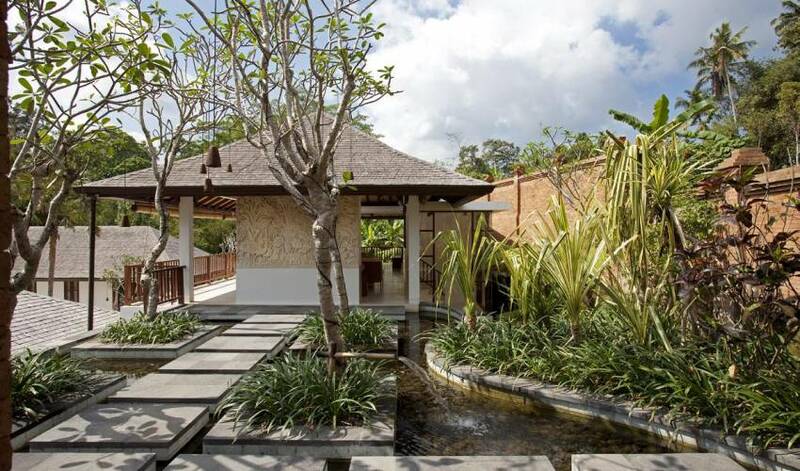 The villa’s main living and dining room is on the villa’s uppermost tier, flanked by a water garden and a rock wall festooned with orchids and tree ferns. This room also provides guests with their first glimpse of the beautiful river valley view. 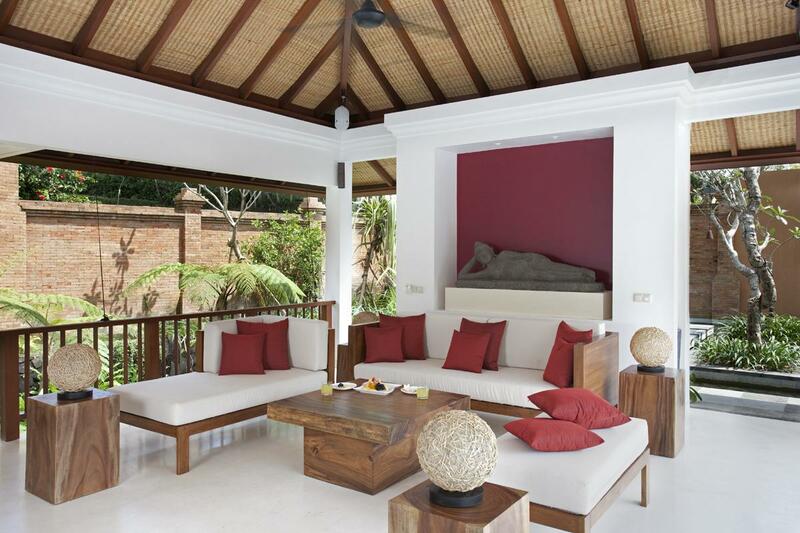 With open sides and a lofty alang-alang thatched roof, this fan-cooled space offers a semi-indoor dining option with a table for 12 conveniently situated next to a self-contained kitchen, and a small sitting area to one side of the dining table. Down at ground level is a covered, open-air sitting space with a bar at one end and an air-conditioned TV room at the other. Wide sliding doors to the TV room can be opened onto the sitting area to create one big sociable space. Outside in the garden, a glass-topped table set upon white marble paving stones, provides dining for 12 under the stars. As night falls, staff light a firebowl at the edge of the lawn, which throws dancing shadows around the courtyard. At the far side of the garden courtyard, the 15-metre swimming pool appears to overflow into the river valley. As you cool off at the pool’s edge you might just see the iridescent blue flash of a kingfisher as it swoops over the water. A spiral staircase winds down to a riverside deck. This is the perfect place to practice yoga or meditate to the murmur of the river. 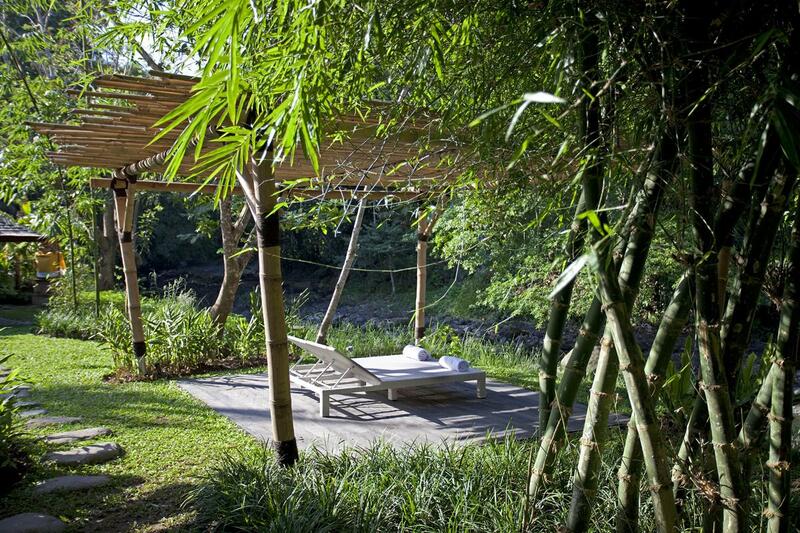 Also on this level is a bale relaxation pavilion – just the spot for a massage. The queen-bedded, orange-hued master bedroom is large and airy, with soaring wood ceilings. Two sets of sliding glass doors lead out to the pool and the garden courtyard with its jungle views. 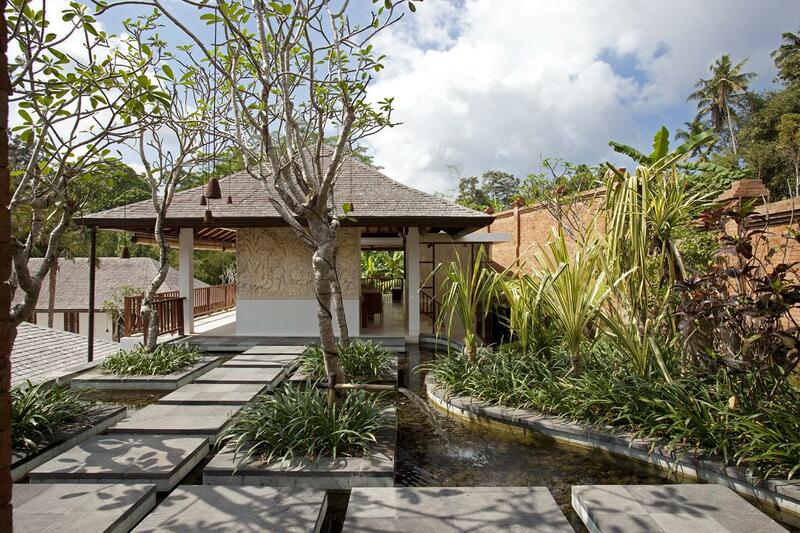 Colourful carved Balinese doors open to a private water garden where a huge river-rock bathtub rests under the sky alongside a rushing creek fed by a holy spring. Themed in a deep red, this ground floor room, with its queen-size bed and ensuite bathroom, opens out onto the pool terrace. What gives this room its edge is its access to a pond fed by a holy spring and backed by a plant-strewn wall, which creates the magical feel of a forest stream. These two bedrooms are almost identical, with hardwood floors, queen-sized beds and ensuite bathrooms that exude class and comfort. Where they differ is in their colour schemes and their views. One room is themed in blue and looks out to the grotto-like holy pond, while the second is aquamarine-themed with a delightful window seat and a stunning river and jungle view from the bed. Both are accessed from the pool terrace. Resting riverside, directly below guest bedroom three, this yellow-themed room is the most private of all and arguably has the best view. Glass doors at the front open out to a waterside garden overlooking the river and the towering trees on its far bank. 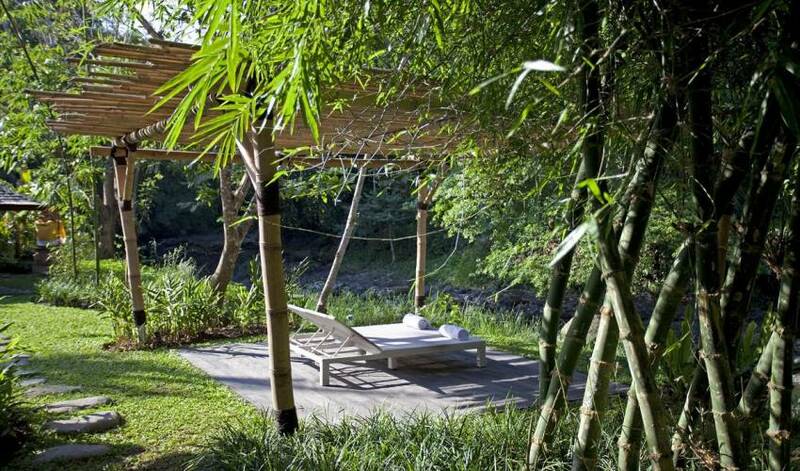 Villa Atacaya is situated in a jungle-fringed river gorge close to the village of Beraban in Bali’s Tabanan regency, which is known as Bali’s ‘rice bowl’ due to its vast terraced rice fields. This quaint village bordering a river is a rare example of a traditional Balinese community barely touched by tourism and the rapid development to the south of the island. 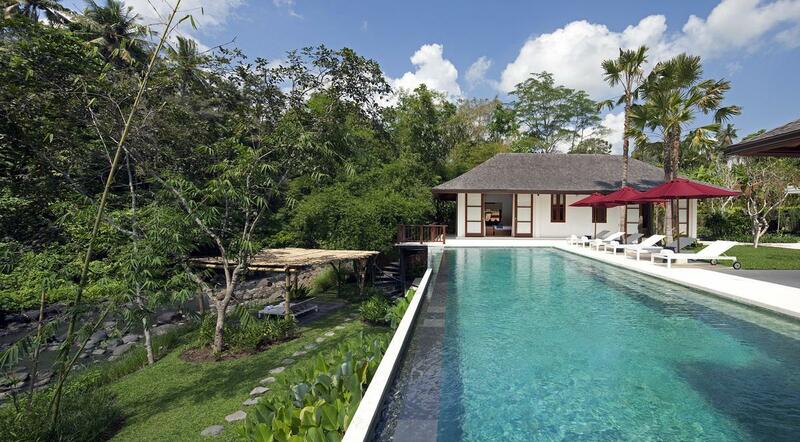 Villa guests are accorded a privileged insight into the agricultural, religious and daily life of the friendly villagers. Just four kilometres away is the famed Tanah Lot sea temple and the award-winning Greg Norman-designed Nirwana Bali Golf Course. 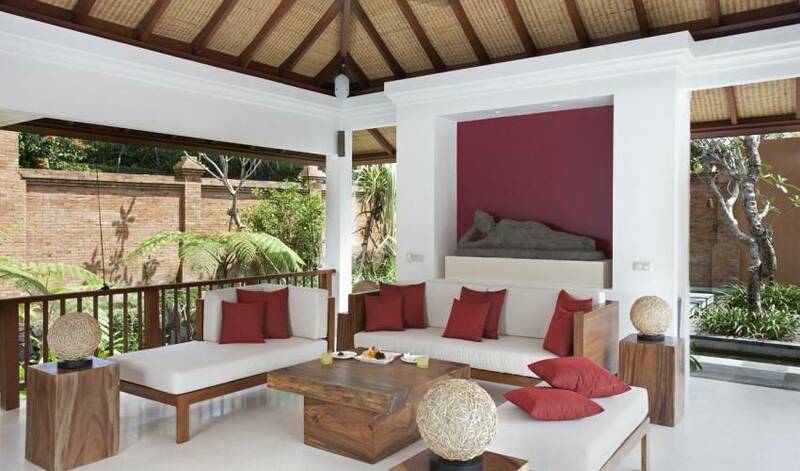 The nearest surf beaches, including Echo Beach, are about eight kilometres from the villa.